There’s no question that fires are deadly. Seldom does a day pass without our hearing the urgent sound of fire sirens. And although we all fear fire’s flames, smoke from a fire is also a deadly hazard—and it’s one many people don’t talk about. In addition to causing respiratory distress and even death, smoke can wreak havoc in a home. So how does smoke damage permeate a home, and what should you do if you experience smoke damage? While smoke damage tends to be more apparent in areas affected by a fire, it usually doesn’t stop there. Smoke damage patterns can be erratic and often depend on the flow of air in your home at the time of the fire. From entering ductwork to permeating curtains and furniture, smoke damage takes place in the same room where the fire occurred—and far beyond. 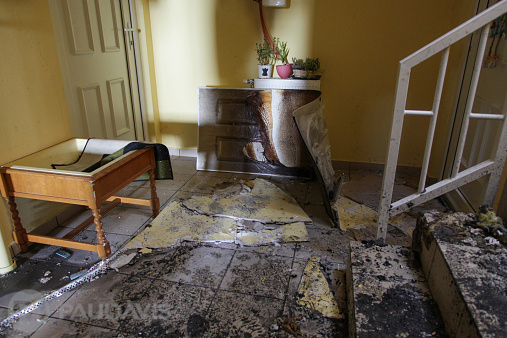 If not dealt with quickly, smoke damage will rapidly increase your restoration costs. That’s because when left untreated for long periods of time, smoke and soot from a fire can permeate surfaces and become increasingly difficult to remove. To help mitigate smoke damage if your home suffers a fire, call a restoration expert like Paul Davis right away. Restoration experts specialize in cleaning up soot and smoke damage — a difficult task that requires professionals. Even before the restoration professionals arrive, turn off your HVAC system to avoid the spread of smoke and soot. You may also open windows and doors to help increase good air flow. When Paul Davis restoration experts are on site, they will clean and safeguard items that were exposed to the fire, help you organize and handle your insurance claims, and much more. Understand that This Is No Time For Second Best™. Fires can be devastating for home and business owners. It’s important to work with a company that understands smoke and fire damage restoration so you can avoid further damage to your belongings and your property. Only an expert will know how to help you prevent further damage while minimizing the cost of fire and smoke damage to your home. Always be wary of contractors who show up on your doorstep and talk about their fire restoration services. Often they can cause more damage than they fix! Remember, Paul Davis is available 24/7 for emergency services, and technicians can be on site promptly to help you get the restoration process started properly. With specialized cleaning methods and equipment, combined with skilled and trained employees, you’ll recover more quickly and damage restoration costs will be minimized.